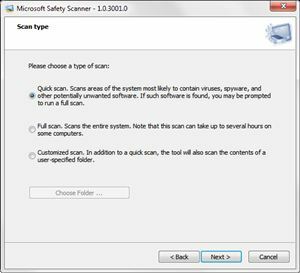 Microsoft Safety Scanner is a free downloadable and portable security tool from Microsoft, which has been designed to provide on demand scanning and removal of viruses, spyware and other malicious software. Microsoft Safety Scanner works independently of other anti-virus solutions, and can works with any existing anti-virus product installed on the system. In fact, it’s kind of last resort to clean the system suspected to be infected with malicious code. To make it simple and easy to use, the program provides three type of scanning options for user to choose such as quick scan, full scan and customized scan. The quick scan option will scan the areas of the system most likely to contain viruses, spyware and other potential unwanted software. For full scan option, it will scan the entire system which may take up to several hours. Lastly, the customization scan will scan the contents of a user-specified folder. Microsoft Safety Scanner is a standalone program which does not required any installation. However, it does not support auto update and will expire in 10 days after being downloaded. Therefore, the users need to re-download the program to get the latest anti-malware definitions. Available in 32-bit and 64-bit version, those users who like to download the free Microsoft Safety Scanner to clean up their PCs from virus infection can download from .